Nostalgia and theory, that’s what this post is all about. I’ve written before that some games require the player to be almost like an actor. You need to follow prompts given by the game, do the right things at the right time and the story will develop the way the developers wanted it to. Some other games though provide you with a stage and let you get on with it. The basic structure will be there but how you end up using it is entirely up to you. Your own stories are generated from this setting. A couple of months ago we took a family trip up to Glasgow for a couple of days. The city was on a slight comedown from The Commonwealth Games which had finished two days beforehand and various locations were being dismantled. A trip around the usual places to visit whilst shopping in Glasgow City centre saw me in G-Force, a games shop on Union Street. Towards the counter they have a cabinet full of stuff that’s slightly off the beaten track. 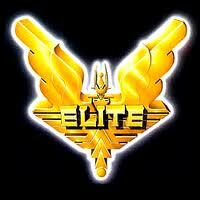 It was there that I saw a copy of Elite. Not just any copy either but the version for the Nintendo Entertainment System, the very same as the one I sank so many hours into back in the early 90’s. 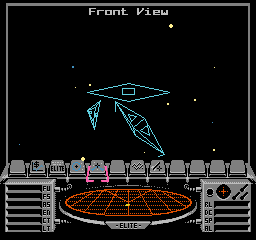 Elite looks simply now, the wireframe graphics off the time were more driven by the limitations of hardware rather than any artistic direction. This game however crammed so much into such a small amount of memory. You started alone in the universe with nothing but a few credits to your name and a basic ship that has a small cargo hold. There were no missions as such, the game had absolutely no main story which stuck all the part together, you were left to your own devices. The first thing any self respecting space pilot needed to do was make money. The task of identifying trade runs was a primary task in Elite, the entire galaxy was connected by an economy. Buying up food supplies that an agriculture based planet had in abundance meant you could sell them for vast profit at a nearby industrial base. Taking machinery back the other way meant you could make a fair amount of money even after the price of fuel was taken off. Repeating this process between different areas soon enabled you to afford bigger and better spacecraft and the decision had to be made if you wanted your cargo hold bigger to fit more items in or equipping guns to fight off those who might like to steal what you have. The game had an ever expanding universe as planets were created by the game as you went along. I’ve long since forgotten what all those dials mean. I resisted any purchase firstly because the £29.99 price tag seemed steep and that fact remained that I lack the console to play it on. The biggest reason was also that I don’t think I could face starting the game again. The vast amount of time, which I no longer really have anymore, I’d put into the game previously would be void. Part of me is happy at the thought that somewhere in the attic of my parent’s house is the cartridge with my save on. My ship, now armed to the gills with various missile launchers and laser cannons is docked at some remote planet and has been for the last 20 years or so. I usually forget controls to most games after not playing them for a month or so, I can only image how lost I’d be if I returned to Elite after a two decade long absence. Elite has had sequels since then of course, the latest is the crowd funded ‘Elite Dangerous’ which is due out on PC fairly soon. The beta version was the subject of many a video play through from Jamie Trinca over on Videogamer.com. You can check out the first part right here. Sadly I dropped out of the PC gaming arms race a long time ago so I won’t be partaking in what looks like a rather fantastic reboot of the franchise but I’m pleased to think that it’s being brought back into the modern day complete with all the online multiplayer gubbins we’ve come to expect. I don’t want this blog to be used for political comment but today seems like an exception. I’ve just taken a walk up the road into the town centre to cast my vote in the Scottish Independence Referendum. There’s were no fights outside, no shouting matches across the street and the booths were doing a fairly brisk business. The electorate, on both sides of the debate, seem engaged and people are realising that what they put on that slip of paper can have a bearing on the result of this vote and the future of Scotland and the United Kingdom. I live in that red bit at the bottom. Being based very much on the border between England and Scotland (I work in the former yet live in the latter) I had a fairly constant stream of customer yesterday who, upon hearing my accent, asked me what way I was voting. I didn’t tell anybody then and I probably won’t say it now. I wouldn’t expect anybody else to tell me what they were voting because the only person you should have to justify your political choices to is yourself. Whatever box you are crossing today I wish you all the best. We’ll know the result tomorrow and I feel that Scotland’s political landscape will very probably be forever changed by the events leading up to this vote regardless of outcome. Here’s a thing I want you to see. Ideas are brilliant. Those flashes of inspiration that hit at random moments are something we all have. The trouble is making them something more than just a thought process. People have the ideas sure, if they’re lucky they’ll have the talent as well but it’s often money that plays the vital role in giving an idea wings and making it fly. A bit of finance makes an idea into something real and then to something bigger after that. Today, whilst I was on a break from my script writing, I saw a tweet from Dave Cook. To explain, I don’t know Dave. I’ve never met the guy and my link to him is reading some fine examples of video game journalism he has written in the past. Dave has had an idea, he wants people to support him in order to get it off the ground. It’s a web comic called ‘Bust’ and it looks amazing. I’ll let Dave explain himself. Far be it from me to tell you where to spend your hard earned cash but I reckon Bust is one of those projects that looks well worth it. $5 equates to around £3 right now, this is probably about the same as a coffee and a sandwich these days. If it looks your kind of thing then it would be the awesome thing to support it. People often get this idea of needing to be some kind of media multimillionaire in order to back any project but it’s not the case. It doesn’t have to be a massive financial outlay on your part, just a very small amount given by a fair bunch of individuals can get that idea flying. The world’s a better place when ideas starts flying as well. I don’t like picking at scripts, taking a few hours here and there. It means that whenever you return you have to find where you left off each time and attempt to get into the swing of the whole thing. I prefer to have long blasts at writing, spending a few long hours on it and knocking chunks off the total. It feels much more like progress that way. I have three days off work now and Order For Burning’s first draft has sat alone for the last couple of weeks. I’ve done a rewrite of The Salesman’s Gamble in the meantime as the producer who was interested in it wanted one and I thought it prudent to get it done and away. But we need progress, no point standing still , nobody gets rewards for standing still. Apart from the human statue. After dropping off my son at school this morning I had breakfast by 9am (I usually wait to get back before I eat). Around 9:30am I’m launching back into the script, tackling the awkward middle portion. It reads like a complete mess and I’m cursing it as I type but it needs done. I’m pretty much at the halfway point . Once over the hump of setting up the ending it should be downhill from there, hurtling into our finale. The Conquistabores Episode V: Royal Rumble 1989. Here’s Episode 5 of The Conquistabores if you fancy listening to me and a couple of friend talk about old pro wrestling for a while. I always have an absolute riot recording these podcasts, I hope you can tell.